In 2007, well over 1,300 Life Chains were built in America and Canada, and the focus is now on National Life Chain Sunday 2008—to be held October 5, Lord willing, from 2:30 to 3:30 in each time zone across North America. To include your city in 2007, notify National Life Chain of your interest via email National Life Chain or call (530) 674-5068 and download (from this web site) a copy of the Life Chain Manual, along with "15 Steps To A Strong Life Chain." Thereafter, inform your local pastors of your Life Chain plans as early in the New Year as possible, and ask them to schedule your Chain on their church calendar. Early notification to pastors helps to emphasize that your Life Chain is important to you and, hopefully, that it will be to the pastors, also. Pro-life describes the political and ethical opposition to elective abortion, and support for its legal prohibition or restriction. Those involved in the pro-life movement generally maintain that human fetuses and, in most cases, embryos are persons, and therefore have a right to life. The pro-life position is commonly supported among several Christian and Muslim countries. On the issue of abortion, pro-life campaigners are opposed by pro-choice campaigners, who generally advocate for women's reproductive rights. These durable 18"x24" signs may be used during a Life Chain. After the Life Chain, they can be used at other Pro-Life or Anti Abortion Events. Optional wire stand allows one to establish a pro-life - anti abortion witness to their city all year long. Made of durable chloroplast, These signs will withstand the outside weather for 3 years in southern states. Some people, use a ladder and nail these to trees for a permanent witness to the community! Wire stands are an additional each. Contact before order to insure stock is on hand. Shipping for 100 signs, call us. 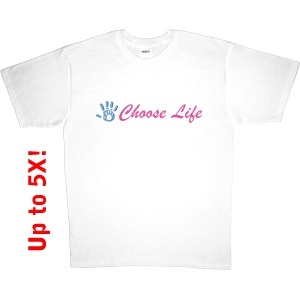 Be a Christian witness to your community using pro life T-shirts. 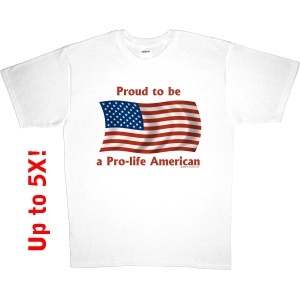 A conservative or patriotic t-shirt from the Pro Life Depot sends a message. Be a witness to your community using pro life T-shirts. A car bumper sticker or wearing the precious feet sends a message. Abortion violates God's command, "Thou shalt not kill." The Bible teaches us to be pro life and anti abortion. 16. “In that I command thee this day to love the LORD thy God, to walk in his ways, and to keep his commandments and his statutes and his judgments, that thou mayest live and multiply: and the LORD thy God shall bless thee in the land whither thou goest to possess it. "Jesus is Lord" was a corporate confession of the Christian community. One of the most striking but overlooked features of the New Testament is the frequency and simplicity with which Jesus is referred to as "the Lord" or "our Lord". In Romans, his greeting includes an extended description of the gospel, which concerns "Jesus Christ our Lord" (Rom. 1:3), and he wishes them grace and peace "from God our Father, and the Lord Jesus Christ" (Rom. 1:7). Those who believe Jesus is Lord, do not approve of abortion.